Robert Kraft (Richard Boone) is part of a wealthy small town family, he reluctantly takes his turn as chairman of the local cemetery. He meets the soon to retire cemetery caretaker, Andy McKee (Theodore Bikel). Andy shows him a map of the cemetery, it has white pins for the plots that are unoccupied and black ones for the plots that are filled. Robert accidentally places black pins in plots gifted to a newly wedded couple. He later learns that they have died unexpectedly in a car accident. He begins to wonder, does the map hold some special power, or is he losing his sanity? I Bury the Living offers an intriguing mystery centered on an curious looking map. The movie makes great use of many surreal noir touches; a ticking clock’s second hand turns into a black pin, the pins in the map that loom larger and larger throughout the film, and Robert silhouetted against a large glowing map as he contemplates suicide are just a few choice moments. The resolution to the mystery is disappointing, but there is just enough ambiguity sprinkled into the climax to keep it from being a total loss. The jumbled end feels studio interference, but Albert Band tries to pull it together the best he can. 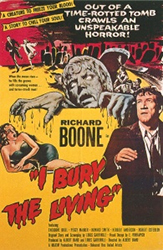 I Bury the Living is a neat little hidden gem of a 1950s noir/horror film, filled with original ideas and images.